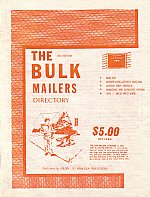 Description: 16 pages, 8½x11 offset, information for bulk mailers, directory of US mail traders using bulk mailing, ads, $ 5. Amelia helped me in buying the GIANT SIZE Webster Dictionary from New York and mailed it to me to Finland. Thanks !